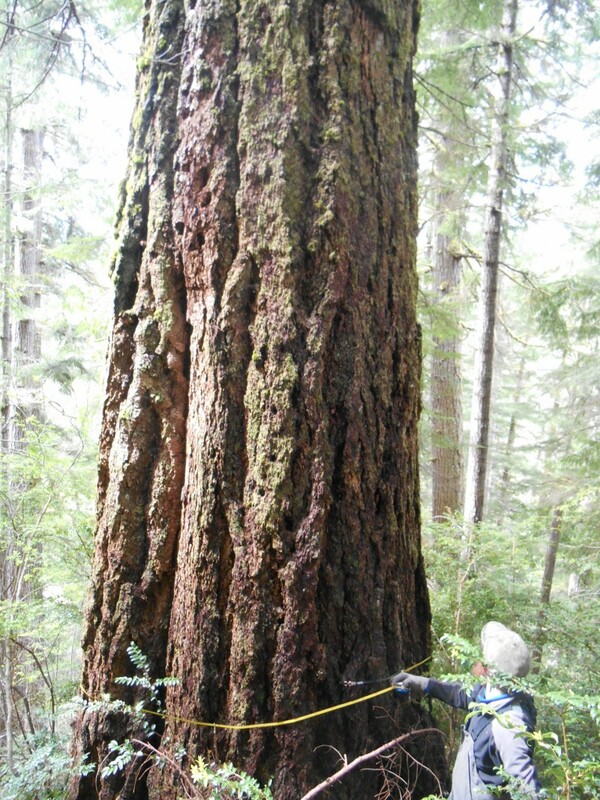 CRFW Surveyor measures an ancient doug fir in East Hakki. Last week surveyors with Coast Range Forest Watch (CRFW) observed marbled murrelets, endangered seabirds that nest in coastal old growth, within the 788-acre East Hakki Ridge Parcel in the Elliott State Forest. East Hakki is a tract of forest recently auctioned by Oregon’s Department of State Lands for privatization. The highest bid was submitted by Seneca Jones Timber Company of Eugene, Oregon. Seneca Jones has publicly stated that they intend to clear cut East Hakki. Marbled murrelets are federally protected under the Endangered Species Act, and any logging operations in occupied habitat would be illegal. East Hakki Ridge is one of five parcels in the Elliott State Forest authorized for privatization by the Department of State Lands this past April. Several conservation groups are challenging the State’s sale of East Hakki in a lawsuit. Based on the protocol written by Pacific Seabird Group, marbled murrelets live in a stand if they exhibit “occupied behavior,” such as flying at or below the canopy height of the forest being surveyed. This is exactly what members of Coast Range Forest Watch witnessed in East Hakki last week. Coast Range Forest Watch is a Coos County group of volunteers concerned about the health of forests and watersheds in the coast range of the Pacific Northwest. Surveyors with Coast Range Forest Watch are professionally trained under the Pacific Seabird Group Protocol and have undergone the same certification process that land agency surveyors complete.